I wouldn’t say that I am prescient, no, not that I can see what the future holds or what will happen, but I do have a knack for imagining outcomes—vividly and visually in grand detail. If it involves my sons, I can tell you that generally, I imagine the worst. I understand a lot of mothers do. When my mother was alive, she always called me at my apartment or later my house and asked me what was wrong, because she knew, she just knew, and damn if she wasn’t right pretty much all the time. If something was wrong, my mother felt it, no matter where I was. Or how old I was. I did a l ot of denying in college, not so much years later. So I understand this may run in the family, this sense of something awry. I listen to my instincts and I also visualize what can happen as a scene unfolds. I am not a hovering helicopter mother who routinely predicts horrific scenarios for my boys so I can swoop in and save them, but sometimes I am afraid and rightfully so. And I see it before it happens, even if it doesn' happen at all. It was Saturday, January 22, a home OPRFHS Huskies tournament, 14 teams competing and Colin was pumped to place hopefully, perhaps even to win. He knew the competition was steep, several wrestlers at his weight were ranked – he had earned an Honorable Mention on Illinois Matmen-- and he was just back from a shoulder injury and three different trips to the orthopedic specialist for checkups to make sure he could go back to wrestling. 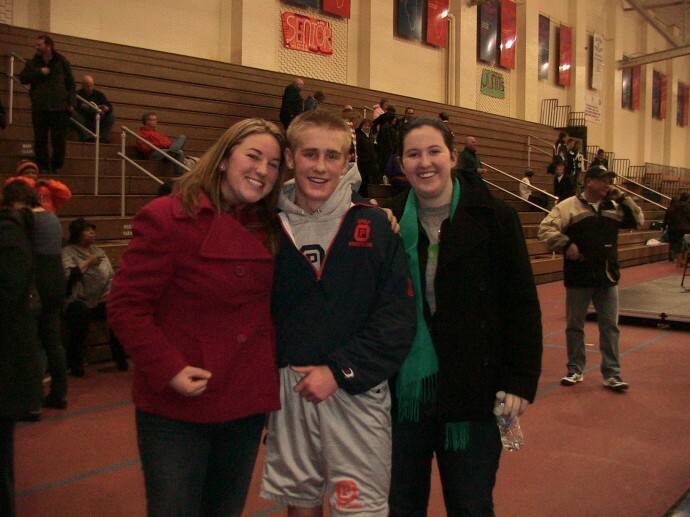 The night before he beat the 130 pounder from Glenbard West at the Huskies home dual. That night in the stands I cheered like a crazy woman and my nieces Katie and Maggie did too. Cousins Katie (left) and Maggie (right) with Colin the night before his injury. We were back in the fieldhouse and Saturday morning Colin pinned his first opponent in the first match. I texted Weldon and Brendan. It was going to be a good day. 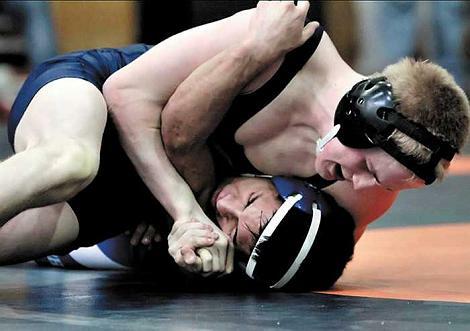 Now it was noon and he was up against a ranked wrestler from Minooka in the semi-finals. Just a minute into the first period, Colin was trying to escape-- get his one point, you have to get your one point-- when the other wrestler took him down and slammed him backwards on the mat. The back of his head took all the impact, it thudded loud and thick and solid like a bag of sand onto the shore. His body went instantly limp. I was videotaping his match from the sidelines, kneeling 30 feet from him, and the mother of the other wrestler was shouting, “Oh god, oh God,” and I almost asked her to shut up, but I knew she was only trying to be nice and I was grateful she was empathetic and not gloating. Because sometimes the mothers of sons who obliterate other sons in a wrestling match smirk. Honestly, some of them even trash talk about your son. No kidding. From where I was now standing , I could see Colin unconscious, completely immobile, out. In my mind’s eye, in that future scary place I go to and have gone to since they were daredevil toddlers, I saw him paralyzed. Forever. I saw him in a wheelchair, 30 years old. I saw me pushing him, I saw his life changed from this very second. I didn’t take my eyes off him or the two trainers trying to resuscitate him with spiral motions to his sternum. He didn’t move. I watched as the coaches surrounded him, all desperately attentive and Colin still did not move. All my peripheral vision was erased, I saw only this circle with Colin as the center as if it was spotlighted on the stage and the rest of the world went dark. I waited; I said the Hail Mary over and over and held my hand to my mouth so I would not scream. I wanted to scream. Oh my God, I wanted to scream and my head and my chest felt like they were in flames and my hands got so hot and wet but I just stood there, waiting. Parents were mumbling, wrestlers were pointing. No one wants this to happen. No one wants anyone to get hurt. A brain injury least of all. It felt as if the entire gym morphed into a hole void of all animation; only the trainers working on him were in slow motion and all I could see was Colin lying on the mat, face up, not moving, his legs sprawled, and his arms at his side, like a Raggedy Andy doll. I thought it was two minutes until he came to; the trainer says it was less than that, honestly it felt like an hour and a half. The first part of him to move was his left knee. I breathed. “He’s moving,” a father said behind me. The coaches and trainers helped Colin up, he wobbled. The gym erupted in applause. He looked dazed. Coach Powell walked him to the side where I was and I scooped up his sweatpants and headgear, carried his water bottle. He knew his name. He knew where he was. He knew the date. “Get him to the ER now,” the trainer said. “Someone will help him get his coat and backpack from the wrestling room. Call me,” Coach Powell said. The trainer gave me more instructions. I listened as best I could. I drove deliberately and calmly to the hospital. I was good in crisis. I handled enough of them alone. Seriously, I have had a lot of practice with the three boys in 22 years. I had been in so many emergency rooms with the boys so many different times that I knew how it went; I had good insurance, this hospital emergency room where we were headed was usually great, the staff did not make you wait long. No matter what, it did no good for anyone for me to be emotional, it did no good to be upset or distraught or even demanding, you just remained calm. You don't want to be the screaming lady on the life boat. Chances are somehone will push you out of the boat altogether. That sense of lucidity helped when Brendan nearly severed his left index finger in shop class his senior year of high school. When the school nurse called me on my cell phone, I was driving down Sheridan Road into work and she was more unnerved than I could afford to be. “Brendan’s hand was severely cut with a blade saw,” she said, trembling. “Is it attached?” I asked, thinking for goodness sake they must have ice and a cooler and I can be there in one hour and if they need him to go sooner, for sure, Coach Powell would take him or I could call someone who might be at home today and I can meet them at the hospital, and it will be fine. I actually pictured Brendan with four fingers and thought it would be OK, I mean he still had nine, so I pictured him telling the story to his grandchildren, and then I also pictured it being reattached in surgery, so I have a slew of movies playing in my head at the same time on different screens. I mean, he didn’t cut off his whole arm, right? It would be OK.
And she said yes, it was attached and I started to be able to breathe and I knew I just had to keep driving because getting in an accident with the car would be worse, and I could call Sue, my nurse friend and she would call ahead to the ER and it would be Ok, it would just take hours and then there would be the recovery. OK, as long I was not the hysterical mother, everything would go as well as it could. I can stay calm. I only have Colin to worry about today. He is moving, he is talking, he is acting OK. He will be OK. He is not paralyzed. He ate two sandwiches on the way to the hospital from the cooler he brought to the tournament from home. Colin was talking, he was even mad. "I could have won that match," he said, as if everyone was just stopping him from finishing the period for no reason. I guess it was a good sign. We spent a few hours in the ER. There was no brain bleed, he was respondiong well. We would go back to the sports medicine doc-- a sports concussion specialist on Tuesday. Give him time to rest. We would go back again on Friday --today--and he would be even better than he was Tuesday, in answering all the questions that determine the state of his brain recovery. And we are going back again Monday for him to be cleared. The doc said he thought Colin would be fully recovered and able to wrestle then. Because Colin is hellbent on regionals. And I will go along with the doctor on this because I trust him. And I do see that Colin is better. Just not completely today. Like every other turn of events in the last 22 years of being a mother to sons, this was not the worst it could be. The fears I see before me like a movie on a laptop did not play out in real life. The nightmare did not come true. Still, I understand quite somberly it could have. It could have. So many mothers are no this lucky. Those bad thoughts? The worst will not happen here. Colin will be fine. I can have my mother terrors, but the bad dreams do not have to come true. Note: I made sure this was OK with Colin before I posted. As much as I LOVED wrestling when I was in high school it’s stories like this that make me happy that I was not blessed with a wrestler. Hey, Michele. I’m going to be honest and tell you I’ve been a slacking follower. 🙁 Today is our Sectional meet, though, and I’m a nervous wreck. I mean, I’ve been up since 4 a.m. lol I guess I needed another wrestling mom this morning. You’re tough. You’re boys are tough. And I always understand exactly what you’re saying. I smiled while I read this because I get it. And…I’m glad Colin was fine, and glad he ok’d the post. 😉 So, as silly as this sounds, thanks for being here for me this morning. I was there– you sold me a sandwich. I was also watching Colin’s match when this happened… my heart sank. Said a few Hail Marys myself! I was thrilled to see him back up on his feet and I’m so happy to hear that he is fine. See you at Regionals!